With Lime & Lavender Essential Oils! Contains about 20-30 uses. This handcrafted mud mask will leave your skin feeling toned, fresh, yet very moisturized because the combination of earthy clays and skin-loving oils. Plus the sea weed and green tea provides minerals and vitamins. Gently message on clean dry skin, leave on for 10-15 minutes and rinse. For a better at-home spa treatment, remove mask with a warm wet towel. Repeat this twice a week. This mask is recommended for normal to dry skin. Please use within 6 months of purchase. Have no time for a facial? Try this! For a quick pick-me-up, gently message a small amount, leave for 30 seconds and rinse. 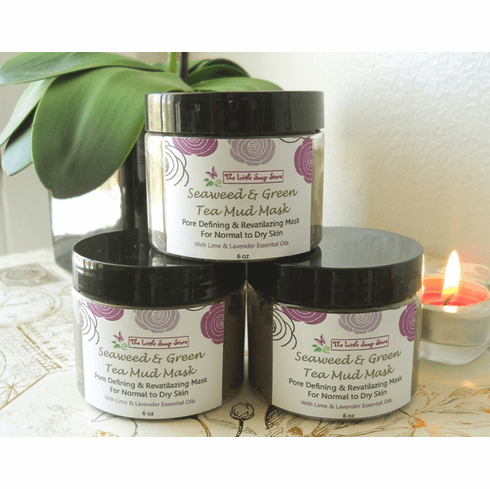 Made with two kinds of clays, natural sea weed, green tea, and 6 skin-loving oils, and lavender and lime EO.